At the weekend, on the way to Ancrum where we stayed for two nights in the campervan, we visited Smailholm Tower, which is maintained by Historic Scotland. 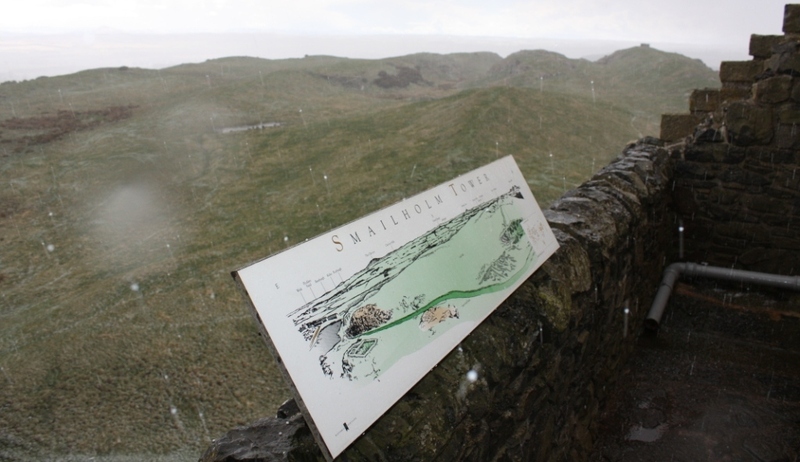 Situated close to nothing very much, on its rocky outcrop in the Scottish Borders and in the late April showers/hailstorm weather, it was dramatic. Inside the Tower is a good display, mostly relating to Sir Walter Scott, who went to the same school that I attended somewhat later. At the top of the tower, which interestingly has a turf roof, you can go outside and see the views of the Borderlands. Unfortunatley when I did so, cauld winter was howlin‘ and you can see the hail in the photo below. I didn’t linger. After that, and once we’d pitched the campervan, we walked from the campsite over to Ancrum Moor, where there was a battle in 1545. 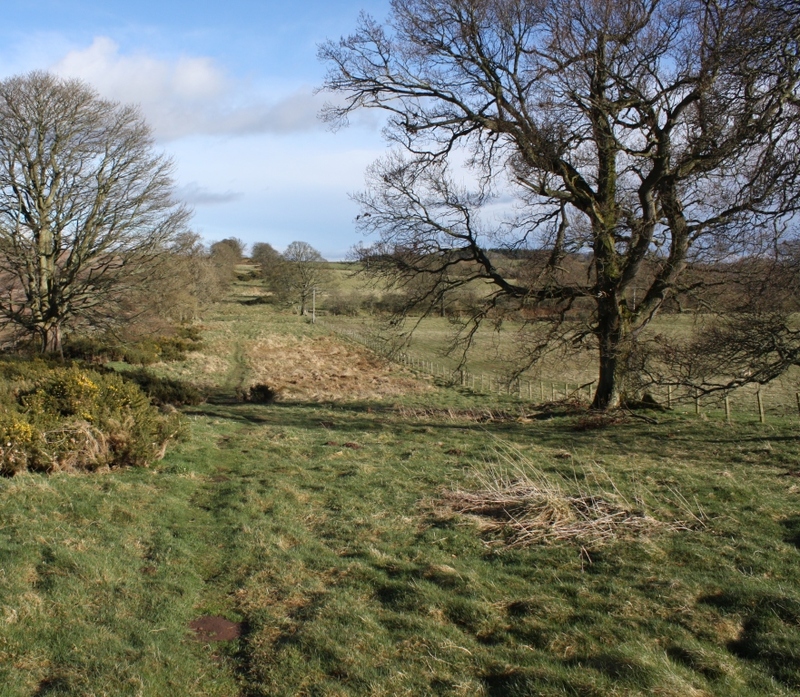 Very close to the battle site is a track which is now part of the St Cuthbert’s Way, and which for this part of that route is actually Dere Street. This was once a very busy and important Roman road, 7 metres wide to allow traffic to pass on both sides, from York to Edinburgh, though you would not realise it, today. Thankfully, Lindsey had remembered to bring Wolfie, so that night no one got cold. 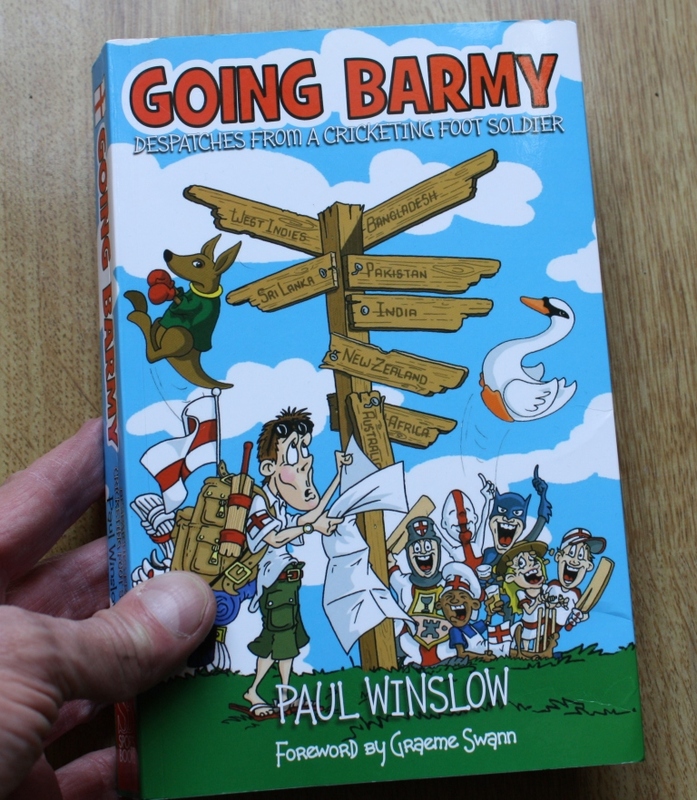 I’ve just finished reading Going Barmy: Despatches from a cricket foot soldier, by Paul Winslow. As this book reveals, there’s much more to the Barmy Army than hour-long chants of ‘Barmy Army’ during Test Matches. The Barmy Army was the name given by the Australian press to sections of the England cricket team’s overseas supporters. They follow England wherever they play, and Paul Winslow gives an insider’s account of what it is like. One of the happiest moments for the Barmy Army was when Mitchell Johnson was castled first ball at the Sydney Cricket Ground. As he walked out to bat, Johnson was greeted with a song the Barmy Army had composed for him. In the video below, at 2.20 you can hear this song, then at 3.25 he’s out for a duck, and the Army explodes. I’ve added the following titles to JournalTOCs, the free current awareness and alerting service for researchers, students and lecturers. JournalTOCs now contains details of the latest Tables of Contents of over 21,700 scholarly journals, including more than 5,500 Open Access journals, and is the largest freely available collection of scholarly journal Tables of Contents. 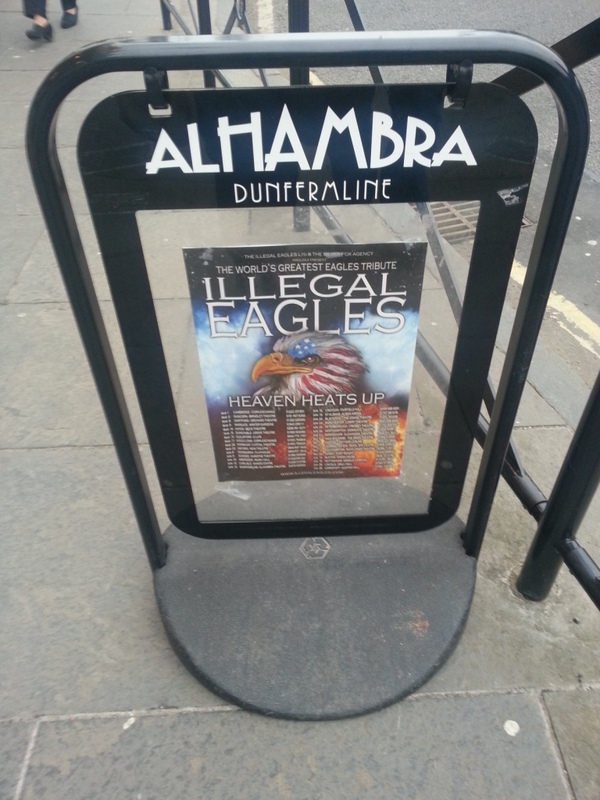 A very enjoyable concert last night at the Alhambra Theatre in Dunfermline, where we saw The Illegal Eagles. This tribute band has been together for many years, and they are great! A very tight band with superb vocals and instrumental skills. Unlike some other tribute bands such as The Bootleg Beatles, they don’t try to look like the original band, but they certainly sound like them. The crowd loved their performance, the acoustics from where we were seated were good, and all the favourites (old and more recent) were covered. Their current tour details are available. For some reason or other, we didn’t arrive at Fifi’s party last night until almost midnight. By that time, the place was in full swing. The music was loud, and people were dancing, especially when someone eventually managed to work out how the sound system worked. People my age should leave that sort of thing to the younger generation, because they know which buttons to press and can also see the buttons without changing spectacles, which can make quite a difference. I felt rather spare, completely sober, walking into a room full of people who had been drinking all evening. My carryout was four cans of Polish lager. No-one else will be drinking Polish lager, so you’re not going to lose your stash. Lindsey can work a room full of people when sober, but I can’t, so I didn’t really talk to anyone until the third can. This gave me a little time to watch a wild, wild woman dancing with great gusto. She had a mass of long frizzy hair, and even managed to do the splits, which took everyone by surprise. I know someone who’s party trick is to stand on his head in the middle of the dance floor, but seeing someone jump in the the air and then do the splits beats that. The fourth time she attempted the manoeuvre, something ‘gave’, and she went and sat down with a look of considerable pain on her face. I had a very informative discussion about Ska music with three people who all seemed to be experts on the subject. I learnt about its origins in the West Indies and its fusion of calypso and jazz, which returning immigrants brought back from Harlem, and its eventual evolution into 2 Tone. The off-duty taxi driver seemed particularly knowledgeable on the subject, and in return I told him what the word ‘dichotomy’ meant, though he’d had too much beer to be able to spell it. I was surprised that, even though he was a taxi driver and knew about music, he’d not heard about the Black Cab Sessions, of which this is one of the best examples. On the way to Braemar we also stopped off to look at the Tomnaverie Stone Circle. This circle can be found a few miles north of Aboyne, and was built about 4,000 years ago. There are some theories about framing the mountain of Lochnagar and the full moon between the two remaining large upright stones on midsummer’s day. In the photo above, a snow-capped Lochnagar can just about be seen between the upright stones. Here is a good website about the circle. I once climbed Lochnagar with the Lone Groover, in the snow. We were descending from the top in a blizzard, off the path and in the middle of nowhere, when he stopped in his tracks, bent down and picked up a frozen Pound note. On the way over to Braemar we stopped off at the Peel Ring of Lumphanan for a picnic lunch. Not a great deal is known about this earthwork, but it is of Norman origin, and was a secondary residence of the Durwards. Here is the Wiki entry for the site. 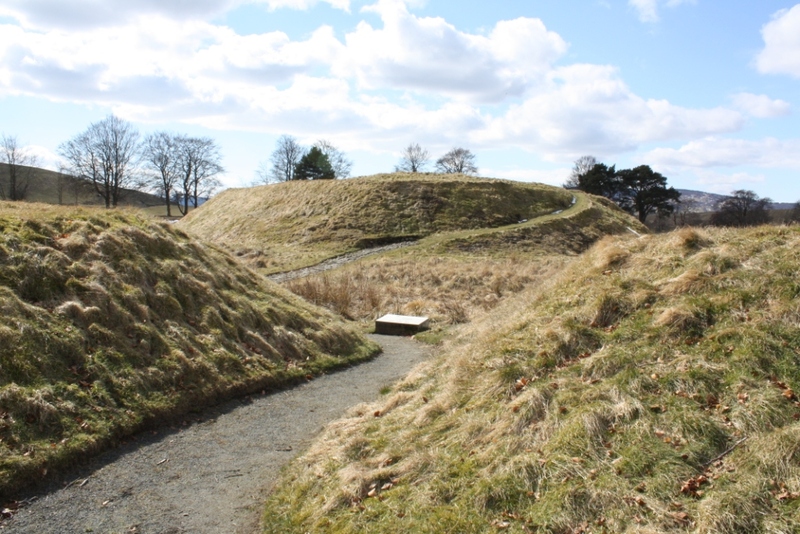 In the 19th century, local villagers used a level area inside the lower earthworks as a curling rink, and you can still see the outline. 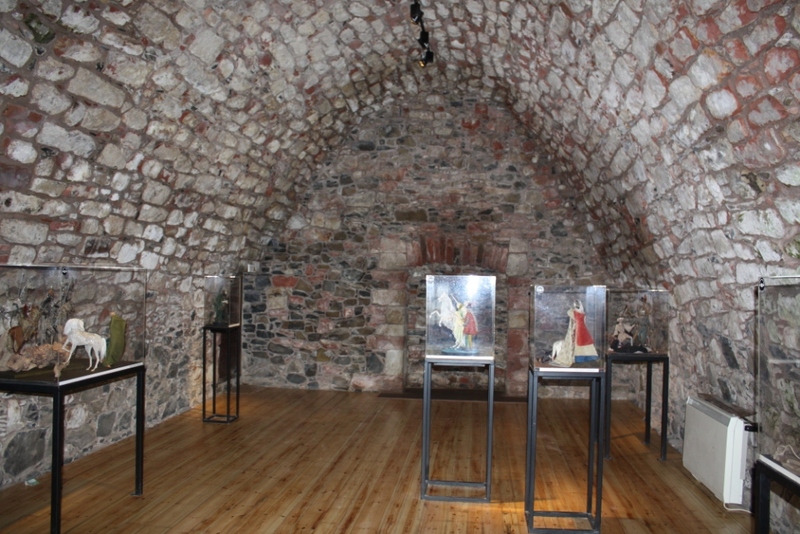 In 1057 Macbeth was beheaded at Lumphanan after his defeat in battle.